Sacramento Vehicle Wraps - Advertising Vehicle Graphics | Palmer Signs Inc.
Palmer Signs continues to win national awards for vehicle wraps because of our great attention to detail, creative execution, and use of the latest technologies. That is why more Northern California companies choose Palmer Signs when they want their brand and their vehicle to stand out from the crowd. Each vehicle wrap will be seen 30,000 to 70,000 times per day. Our veteran team understands the nuances of each vehicle and how to utilize our state-of-the-art products to give you a durable, professional look that will power your business. A custom vinyl wrap will turn your vehicle into an on brand, rolling billboard. Wraps attract attention and give you an opportunity to make a statement about who you are as a business. They simply can’t be ignored and, unlike traditional marketing strategies, you won’t be sharing an ad square or billboard with any other company. Unlike other forms of traditional advertising, statistics show that on average, a wrapped vehicle can be seen by 3,000 people every hour. Compared to broadcast media, direct mail, or the yellow pages, your ‘ad’ is always on, whether your vehicle is parked or in motion. Palmer Signs can transform your entire fleet of vehicles to make sure that every contact that you have with the world provides your best first impression. Give us a call today to learn why so many leading Northern California companies trust their fleets to Palmer Signs. Whether your business is small or large, vehicle wraps will put you on the same playing field as franchises and companies that are large enough to maintain fleets. The exposure generated from car wraps, truck wraps, and fleet wraps is simply unparalleled among out-of-home advertising methods. Palmer Signs has a wrap solution for your business needs. With partial vehicle wraps, graphics are applied to just a portion of the car, truck or trailer. Typically, partial wraps include art on the rear of the vehicle, partway up the sides and the hood. Partial vehicle wraps are so carefully designed so there’s a nearly imperceptible transition between the vinyl and your vehicle’s paint. Full vehicle wraps are exactly what they sound like: High quality vinyl graphics are applied to every exterior, painted surface, including the hood, sides, rear and, rear windows. Typically, full wraps on larger vehicles (food trucks, for example) do not include the roof. Vehicle wraps are an investment, and you’ll want to make sure your vinyl wraps are installed flawlessly. We’ll put together a plan for the best way to wrap your vehicle, depending on its type and size. Our Graphic Design team will then ensure that your brand and vehicle stands out from the crowd. Our staff of certified installers possess a thorough understanding of the very best methods, and the attention to detail that will ensure your vehicle wrap is installed correctly and intended to last. After everything’s installed, which, we’ll make sure nothing shrinks, bubbles up, or peels back. If something’s not quite right, we fix it before we hand back your keys, even something no one’s likely to notice. Your project needs to look great on day one, but if it looks haggard and worn after time your brand takes a hit. Palmer Signs only uses the industries best products to ensure that your brand looks great for the life of the wrap. 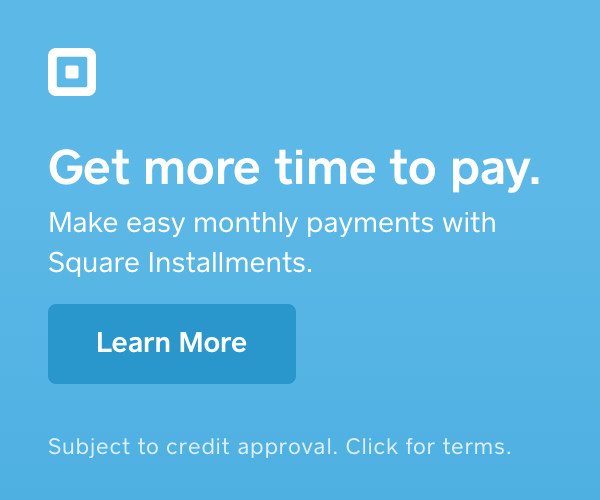 With Square Installments, you can make monthly payments for your vehicle wrap investment.